Renowned software providers Microgaming has released its hottest panda themed new pokies game, Wacky Panda. The three-reel, one pay line design makes for a simple gaming experience suitable for players of all expertise. If you hit the highest value panda, you could get up to 1,111 times your wager. Meaning this could lead to exceptionally profitable pokies gameplay. Teamed with the modest strategy, the bankroll starts from just 1p and can payout anything up to £16,000 in one go. The bankroll allows players of any cash flow to engage in the colourful game. Simplicity is key at Wacky Panda. To win, all you need to do is match two of the main character symbols, regardless of their positioning. How much you win, will be dependent on the bet per line. The one fixed payline in place means that each win is determined from left to right. Visually, Wacky Panda makes for an exciting rainbow of colours. It catapults you into the Orient with an animated Asian theme aided by its colour scheme. As you progress through the game, you’ll get to know each panda’s zany personality. 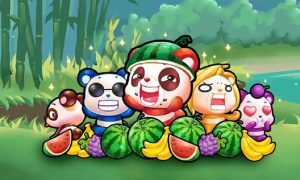 You’re sure to fall in love with the hilarious panda characters, who are surrounded by all types of exotic fruits. The animations at Wacky Panda makes for an appealing game to audiences from across the globe thanks to its bright, vibrant nature. There are no bonus features found at Wacky Panda, as it offers a simple, straight forward gaming process. Representing the symbols on the screen are fruits such as watermelons, grapes and bananas. Although the game itself is simple, borderline basic, it’s guaranteed to provide you with hours of entertainment. You’ll be laughing out loud as you get to know the Panda’s and their eccentric behaviour. The animated features are sure to appeal to an audience looking for an element of escapism and to embark on a zany Asian adventure. There’s chances to win big if you land on the higher valued pandas. With a deposit of anything from 1p to £15, it could be worth your while! You can enjoy Wacky Panda through the desktop as well as being mobile compatible.